We are a non-profit professional association. We are the global, multidisciplinary community of professionals who plan, design, and build experiences that connect people to place. We are graphic, information, media, interaction, exhibition and industrial designers, fabricators, architects, technology integrators, brand strategists, students, wayfinding specialists, teachers, and others who have a hand in shaping content-rich, experiential spaces. We are a community of over 2,200 members from 35 countries who gather locally in 34 local chapters and internationally at the annual SEGD Conference and 6 other education events. Read the CEO Updatesto find out how the organization is doing and what we have planned to improve our services for members. What do members say about SEGD? "I love SEGD, its staff, and its members around the world. 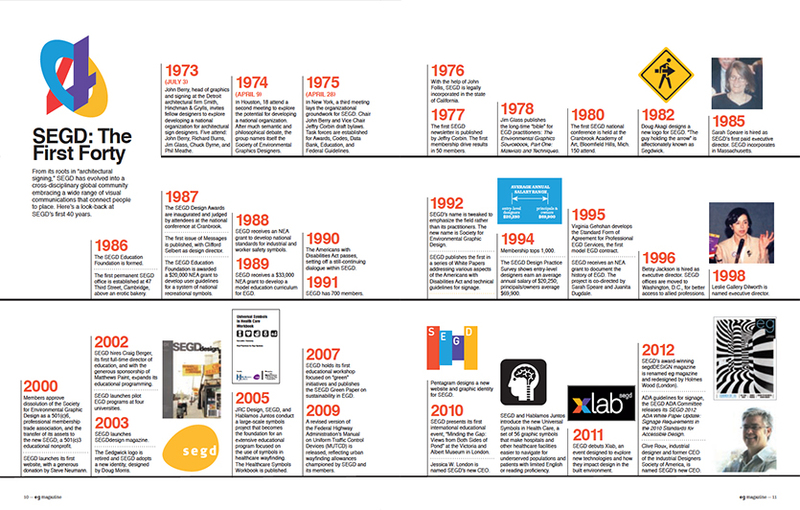 Being named the 2008 SEGD Fellow was one of the highest recognitions of my professional life. And my practice has been enriched by SEGD educational workshops. Congratulations on expanding your reach with the new website and digital edition of the magazine! And I applaud the strategic decision to make SEGD more visible internationally through partnership with Icograda. Thank you, SEGD. Life is beautiful." "SEGD is like a family; you can reach out to fellow members when you need help. In any partnership, it's important to have the right networking in place. And you always want to associate yourself with like-minded people who have the same goals, aims, and aspirations - but how they get there may be very different. That's where our strength lies as an organization - not in our similarities but in our differences. I am glad to be a part of SEGD; even all the way in Dubai, I feel like I am connected." "I rely on SEGD to connect me to the world - and it does. Every day. Which is night in New Zealand." "Joining SEGD has been a massive benefit, giving us access to an international community with unbelievable resources: new business opportunities, information regarding the latest technology, projects and products, and the ability to network and make friends with a broad spectrum of fabricators, designers and clients. It gives us a competitive edge." "Beyond its international awards program, annual conference, and publications, it is the spirit of collaboration between (professional and industry) members that makes SEGD membership so rewarding." “I have wanted for a long time to give credit where credit is due—the team leadership of the SEGD organization. I have been a member now for several years and am often quoted for saying that AIA and IIDA need to get an injection from the formula your team uses. I have had great, great experiences with the educational aspect of SEGD. Not only have I benefited, but so too have my employees, clients, and my mentored students.